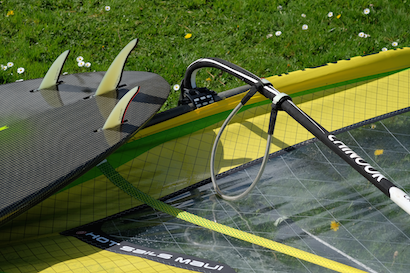 An asymmetric shape allows you to further optimise a board for use in the dominant conditions where you usually sail. They’re a lot of fun even if you only get to sail mostly onshore wind swell conditions but in classic cross off ground swell conditions they add a new dimension of performance. I’m fortunate in that my home spots lie along the west Cornwall coast and has me mostly sailing at Gwithian, The Bluff or thereabouts and heading out on port tack most of the time. 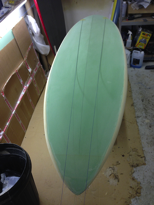 I built a few asymmetric boards for myself back in the mid 80’s when they were very popular in Hawaii. Most people thought they were a bit of a nonsense for the typical UK wind wave conditions but once I’d built and sailed one I was sold on the idea. I’ve long tended to enjoy building things a bit different to ride myself because I learn so much from this experimentation. In those days I built for my local Brighton, UK, south coast conditions (Including the board pictured on the right from…er 1985!) and found them huge fun because of the way they turn so differently on each tack. Every board is a compromise but an asymmetric does allow you to create a board that is less of a compromise relative to your local conditions. The basic premise being that different shapes work better for hi speed bottom turning compared to slower more pivotal top turns, be that in quality surf or mushy wind waves. I’ve seen one or two asymmetric boards pop up on the web in fairly recent years, most notably one from the legendary Mark Angulo (http://www NULL.markangulo NULL.com/home/) and well maybe it was time for me to revisit the design as well. My final inspiration for actually building this board came with the arrival of my new Hot Sails Maui (http://www NULL.hotsailsmaui NULL.com) – KS3 (http://www NULL.hotsailsmaui NULL.com/sail NULL.php?uid=26) sails last autumn. 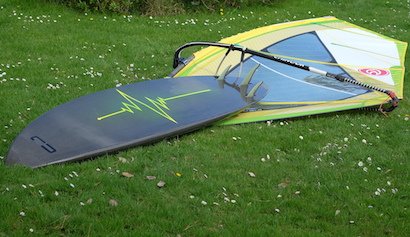 The super responsive, tight turning, yet forgiving, direct and powerful nature of these sails instantly had me wanting a new totally wave focused board tuned to their new school performance characteristics. It also had to be extremely user friendly for someone with less skills than Kauli Seadi (http://www NULL.kauliseadi NULL.com NULL.br)! Secondly it has to deal well with the often heavy chop, gusty winds and strong tides that typify my local conditions. Much is achieved from this. For speed and control on the downwind, bottom turn side, the outline is drawn out with the wide point forward of centre and a narrow tail thus giving a longer, straighter rail line to engage into and through the bottom turn. This makes it easier to confidently set your rail at full chat, and provides excellent grip, speed and chop control through the turn. Whereas the wider more curvaceous side has the wide point at centre and a much wider tail creating more curve in the outline. This encourages a tighter turning arc due to the shorter length of rail engaged as the board is banked off the top and gives more volume and lift to help accelerate out of the turn. 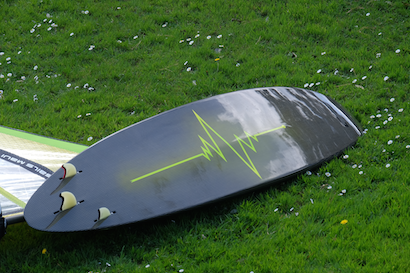 However as the overall tail width of the combined outlines still remains a moderate 36cm you don’t have to contend with the low speed problems of a narrow tailed wave board or the high speed problems a wide wave board has. The foot straps are set off centre according to the final dimensions of the board but central to the actual join line between the two outline templates. This results in the rear strap being significantly closer to the rail on the bottom turn side which again helps with setting up, into and through a high speed bottom turn. 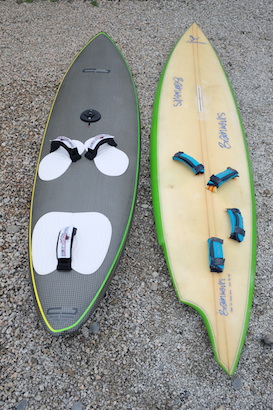 The forward straps are positioned differently as well with the front foot further forward on the bottom turn side again to promote full rail turns. There are many more subtle details and differences as well in terms of bottom profile, wave orientated rocker curve, volume flows and rail profiles that are beyond the scope of this overview. Although asymmetric in design none of these differences are extreme enough to make the board so radical that it couldn’t happily be sailed on the opposite tack if needed and I’ll be blatting about on it at starboard tack Marazion from time to time for sure. I opted for a three fin configuration as I feel this gives the most varied tuning options and minimum drag. The side fins are toed in in such away that they align equally relative to the centre fin but differently from each other which balances them with the water flow and respective tail width and outline differences where the wide side fin is set closer to the rail. Black Project Fins (http://www NULL.blackprojectfins NULL.com) make some of the finest fins you can buy and I don’t know of anyone who hasn’t been delighted when they’ve tested them. The designer, Tom Hammerton (http://www NULL.blackprojectfins NULL.com/about/team-black-project/tom-hammerton-ownerdesigner/) also had significant input into the design of the Hot Sails Maui (http://www NULL.hotsailsmaui NULL.com) – KS3 (http://www NULL.hotsailsmaui NULL.com/sail NULL.php?uid=26) sail so it seems only natural to match these fins with the sails. 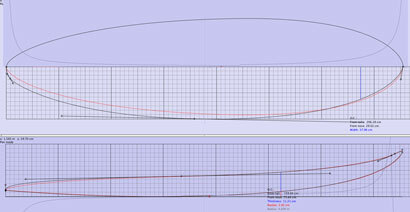 I aim for just enough fin area to do the job required which means less area with high winds and small sails and more area with lower winds and bigger sails. Black Projects are very efficient for their size and I find I can easily go for smaller sizes than I could on my old fins. 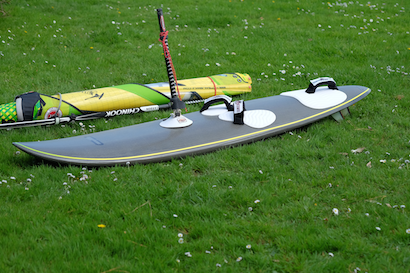 For straight ease and get up and go a large centre fin and small thrusters is probably favourite but as I’m more focused on looseness and wave performance with this board I’ve started with a compact spread of 15.5cm Mini Epic (http://www NULL.blackprojectfins NULL.com/products/windsurf-fins/mini-epic-the-radical-multi-fin-for-twin-thrusters-quad/), plus a Thruster (http://www NULL.blackprojectfins NULL.com/products/windsurf-fins/multi-fin-thruster/) 10cm on the bottom turn side (similar to half a Quad set up) and a Wave Multi (http://www NULL.blackprojectfins NULL.com/products/windsurf-fins/wave-quad/) 11cm on the top turn side for pivot and drive off the top. This gives quite a low surface area of 244cm2 and judging by my first outing with a 4.9m2 sail in pretty weak waist to chest high waves this works really well when fully powered but is a bit lacking in lighter winds. Depending on wind strength the next outing will be with larger side fins at 11cm and 12cm plus the 15.5cm, to give just a little more drive and area at 267cm2 but very little, if any, perceptible loss of looseness. The difference changing fins can make should not be under estimated. If in doubt try a set a bit smaller than those that came with your production board because I think many production boards are biased towards being over finned to make them as instantly user friendly as possible to a wide variety of buyers. Construction is a tough full carbon/kevlar, pvc sandwich, over H glass with selective carbon/dyneema reinforcements and weighs in at a pleasing 6.6kg bare. The fabric is carbon dominant giving high strength and stiffness but with the additional kevlar to improve impact resistance. 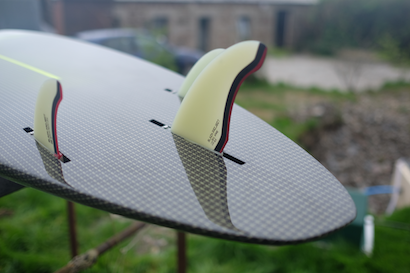 I set myself the challenge to work very precisely and with no filler to utilise the beauty of the carbon/kevlar fabric as the main cosmetic feature of the board. The second challenge was a high gloss finish to enhance the full beauty of the fabric and a simple but effective graphic to tie in with my sails. As a point of interest the gloss finish added less than 200gms to the final weight. Your typical super sanded finished boards are more about labour and cost saving then weight saving. The end result is something I’m proud of that is highly functional, huge fun and uniquely different. Now when is the next decent forecast…!